That has happened to many people! You want to buy a turntable, but it turns out that you need to buy a lot of extras to make it work: pre-amps, cables, speakers, etc. You end up paying a fortune. I know, you just want to listen to your old records! I wrote this article for those who need an easy way to play their records. A plug-and-play unit with built-in speakers. No need for complicated stuff, or buying extra components. Just sit down, relax and enjoy your favorite vinyl music. 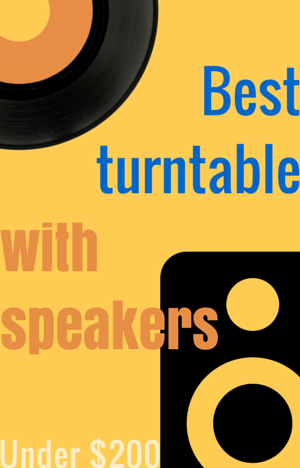 If you are looking for turntables under $200 without speakers? Read this other article instead. Or read my article about Automatic Turntables under $200. Before I continue, I want to warn you that all-in-one record players or turntables with built in speakers are generally bad quality. Specially in this price range. But I understand that buying hi-fi equipment can be very expensive. If you are serious about collecting vinyl or if you need good sound quality, I advice you to invest a little more on a better player or consider buying a second hand or vintage turntable. If you don’t care about sound quality or if your records are not in good condition, then and all-in-one system may be a good option for you. Only the ones with high ratings and positive comments made it to this list. I read tons of reviews and comments. I read the user manuals. I give my verdict, based on the data I have collected. I look for the best value for the price. I also take into account any complaints, product returns and recurring issues. This turntable is one of the cheapest turntables on the market. One wouldn’t expect much from a turntable this affordable. However, I’m including it here because of its high ratings. If you are looking for a cheap turntable with speakers, this one may be just what you need. The JTA-222 is a three speed turntable with a nice retro look. Because of its small size, this turntable is a space saver. No need to mes up with complicated setups and calibration, the Jensen JTA-222 is very easy to use. Like most low end turntables with speakers, this one has a ceramic cartridge. It’s sound quality is not great but if you just want to listen to your old records from time to time and don’t care about high fidelity sound, you should be fine. You can always attach external speakers. This product has many good ratings. Consumers appreciate the ease of use, small size and low price. The main complain from consumers is skipping. So, be aware of this before buying. As I always advice my readers, make sure your record player is leveled, keep your records clean and use the right needle, to reduce skipping. If you need more information, click here to check the detailed review. The Studebaker SB6052 is a three-speed record player with builtin speakers, AM/FM stereo receiver and cassette player. It has a beautiful retro look. Its antique style case is made of decent quality wood. The player feels and looks sturdy. However, the platter and tonearm are made of plastic. The wooden dust cover will keep your records safe during playback. Great feature for people with curious pets. The cassette player is very conveniently located on one side. One thing to note, though, is that the cassette player cannot rewind. It can only play and fast forward. The work around is to flip the cassette and apply fast forward. This phonograph has RCA Line level outputs. If you want a better sound quality than that produced by the builtin speakers, just connect the turntable to a receiver, stereo system or to a pair of external powered speakers. Be aware that this turntable does not have a headphone input. This phonograph is manual but it has a an auto-stop feature, this means that when the needle gets to the end of the record, the platter will stop spinning. You still have to manually lift the tonearm and return it to its rest. Unfortunately, the turntable doesn’t have an arm-lift lever. Auto-stop can be disabled with the auto-stop switch. This is useful when the record has the auto-stop area beyond the stop trigger point of this player. This will prevent the phonograph from stopping prematurely. This product has very good ratings. Consumers appreciate the sturdy wooden construction and the vintage style. Some people have complained that the sound is not loud enough. The good thing is that you can connect external speakers through its RCA outputs. This player has exceeded some consumer expectations based on the price of this product. The ease of use and it’s nice look makes it perfect for people that need a simple plug-and-play phonograph that also looks nice. As it is the case with most affordable record players, don’t expect audiophile quality with this turntable but decent for the price. Some have complained that the sound gets distorted when turning the volume up. This applies mostly to loud music like heavy rock, punk or lots of drums and bass. The radio is a little bit difficult to fine tune, according to some users. Overall, this is a good product for the money. The Crosley Nomad is a vintage style portable turntable. In this price range, this is one of the few turntables with builtin speakers that have a magnetic cartridge. In fact, the replacement needle is the same one that comes with the Audio Technica AT-LP60. The built-in speakers are located on the sides as you can see in the picture. This player is able to play all three speeds 33&frac13;, 45 and 78 rpm. Just be sure to buy the right needle for 78 rpm records. It has a wood style cabinet wrapped with fabric. It’s manual except for the auto-stop. It doesn’t have an arm-lift lever so be careful when positioning the needle. This unit has RCA stereo outputs, headphone jack and an auxiliary input. The auxiliary input comes in handy if you want to play your mp3 player or portable device through the built in speakers. 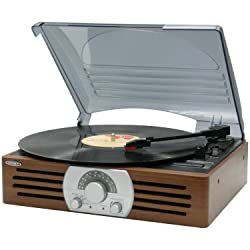 It’s also equipped with an USB port for transferring your vinyl music to a digital format with the use of your computer. The record player comes with Audacity, an audio recording software. I recommend downloading the latest version of Audacity from their official website instead of using the provided CD which is probably outdated. This product has many good ratings and positive reviews. Customers appreciate the nice vintage look and portability. Most consumers are satisfied with the sound quality. Good option for someone new to vinyl needing a sturdy portable record player. Electrohome is a trusted brand that has been around 1907. This model is a 3-in-1 turntable that plays vinyl records, CDs and AM/FM radio. It comes with a 3.5 mm auxiliary input that lets you to connect any audio device like your MP3 player, phone or tablet. It has two front facing built-in speakers. Its classique vintage style cabinet is fihished with real veneer wood. It supports 33&frac13;, 45 and 78 rpm playing speeds. This turntable comes with a diamond tipped ceramic needle. It’s a plug-and-play, easy to use phonograph. Although this player has many good ratings and positive comments, it concerns me that there are many consumers unsatisfied. Most customers are pleased by the vintage look, nice wood finish and strong construction. However, the average perception among owners is that the sound quality is not great but decent. The main complain about this product is that the record player skips a lot. I wouldn’t recomend this player for serious music listening, but if you are looking for a nice retro looking component, then this may be a good choice for you. The Electrohome Wellington has basically the same features and look as the Windstore model. The difference is that the Wellington model has a remote control and a USB port. Note that you cannot connect the player to your computer via USB, is for storage devices like a USB flash drive. The USB port is a very nice feature. You can play audio files, like MP3s stored on a USB flahs drive. But the best part is that you can direclty record from the phonograph onto the USB memory stick. I like this feature because it lets you digitize your music without a computer. In my opinion, the best turntable with speakers under $200 is the Crosley Nomad. I prefer sound quality over look or other features. The Crosley Nomad is the only one, from the 5 models I presented, that has a magnetic cartridge. Every time I compare different turntables, I confirm that the more extra features a component has, the less the quality of the turntable itself. So, as a rule of thumb, all-in-one components have a lower quality turntable. There are other Crosley products that have a magnetic cartridge. If that interests you, look for the ones with the NP5 replacement needle, like the Collegiate or Spinnerette. I didn’t include them in this article because the don’t have good ratings, but I would still take a look at them. Just be aware that Crosley products have a bad reputation among vinyl collectors. With my verdict, I’m not saying that the other models shouldn’t be considered. It really depends on your needs and expectations. If you are not picky about sound quality, and you want a nice looking retro style turntable, the Electrohome turntables will be your best choice. But if you want something with better sound quality, then go with the Crosley Nomad. Finally, if you want a compromise between sound quality and look, get the Studebaker SB6052. I really like its wooden finish. I hope you liked my article. Please feel free to leave a comment, to help others like you choose the right product. 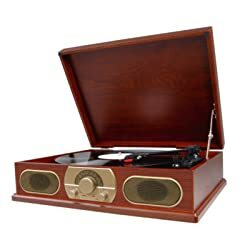 i want to buy a turntable under $200, i´ve seen in the web the crosley switch turntable, but i read that crosley turntables use to scratch the records, should I buy it or not? 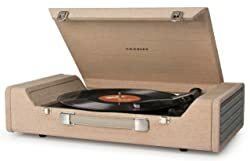 if not what similar turntable should i buy? It really depends on what you are looking for. I would shoot for a turntable that has a magnetic cartridge. The Crosley Switch, like many other low-end turntables has a ceramic cartridge. If you don’t need the radio AM/FM, built-in speakers and bluethood I would instead buy an Audio Technica AT-LP60. It’s about the same price but a much better quality. I can make a better recommendation for you if you tell me more about your needs. For example, what type of Albums do you have?, Are they new or old? Do you need to digitize your muscic? What is the condition of your records? Is high quality audio important to you? Are you fine with small built in speakers?. Would you be listening on a large room, small room? I bought a Crosley turntable from Urban Outfitters. It is basically a piece of crap, the vinyl doesn’t stay flat on the thing, so it skips. The sound is horrible. I’ve also read that Crosley’s scratch up vinyls. Is this try? I was also wondering what you know about Jensen and Sony and if they are known for scratching vinyls. Thanks for posting. Sorry to hear about your Crosley Cruiser. Yes, Crosley Cruisers may be hard on your records. As for Jensen and Sony, it really depend on the specific model that you are interested. I would go for a Sony, which is a more respectable brand. If you didn’t like the Crosley Cruiser, I don’t think you would be satisfy with a Jensen. You may want to try the Sony PSLX300USB USB which is fully automatic. It occurred to me if there was too much bass it might cause the record to skip, no? I mean maybe they intentionally keep bass out of the speakers? I think at the same price range, they all have more or less the same sound quality. I agree with you, if the speakers were too loud and with lots of base, the needle would probably skip unless they were external speakers. I don’t know if they intentionally keep the bass out, but what you say makes sense. You didn’t include the Audio Technica AT-LP60, which I read in your review, you liked very well. Where does it rank in the five you mention above? And do you rank it below the Crosley Nomad? Hi what do you think of techplay odc5e for sound. 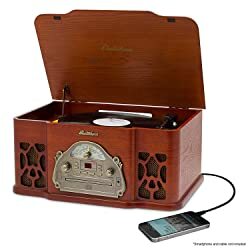 I don’t own a TechPlay ODC5E but judging from the specifications, the sound should be similar to a Crosley Cruiser. However, this one has a lower price and comes with USB connection. I may review this portable record player. It looks like a good alternative to the Crosley Cruiser. If you ever buy this product let us know your opinion.